The adipose tissue that we have in our bodies comes in two colours: white and brown. Each hold their own individual explenation. White fat (adipose tissue) provides the largest stores of energy. This type of fat is composed of a single lipid and has far more mitochondria and blood vessels. 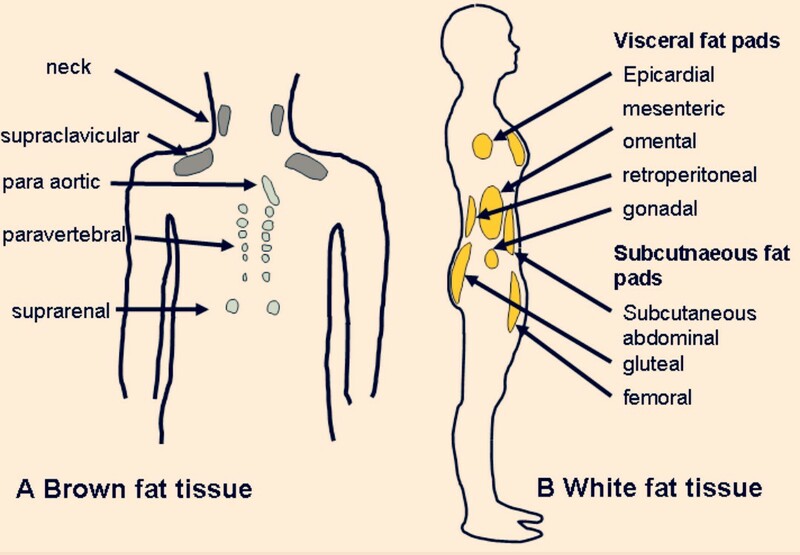 White fat is the predominant form of fat in the body. It is the type of fat that one can see. It also cover our internal organs acting as a thermal insulator and cushion. Excess of white body fat is associated with an increased risk of breast, colon, esophageal, gall bladder and pancreatic cancer. An excess of white fat inside belly ( visceral fat) brings an incresed risk of heart disease and diabetes. We generate white body fat by eating too many calories. Brown fat is a adipose tissue that we can’t really see it when you look in the mirror. It is composed of several small lipid and a large number of iron containing mitochondria (the cell’s heat-burning engine) It is located mainly around the neck and collar bones. Unlike white fat, this precious brown fat is metabolically active. In other words, it burns white fat. So brown fat burns energy. If stimulated, it can burn off between 300 and 500 extra calories a day. And not just any calories, but calories stored in white fat reserves. So just how can brown fat be stimulated to burn calories?How do I activate brown fat? When we’re cold, brown fat is usually the first thing to activate to heat our your body. It generates body heat by burning the white fat. In other words, exposing ourselves to cold temperatures can help burn white fat and also increase our metabolism in a healthy way. Such process is called cold thermogenesis. Unfortunately, brown fat is present in very tiny amounts in adults. Some people have more, some have less. If someone’s goal is to lose weight, their ideal scenario would be a higher number of brown fat cells and a lower number of white fat cells. But can we increase the number of brown fat cells? Yes, according to a 2014 study. The researchers in the study discovered that shivering can actually stimulate the conversion of energy-storing white fat into energy-burning brown fat. They believe that the bonus to having more brown fat is that it is a potential therapeutic target against obesity and even diabetes. When we are cold and we shiver, we generate heat in the body by activating our brown fat. This happens because our muscles contract in response to the environmental shift in temperature. That shivering stimulates a hormone called Irisin, which is produced in our muscles. Irisin, discovered by Harvard scientists in 2012, does two major things in our bodies: It promotes the browning of fat to release energy, which causes weight (fat) loss. It improves glucose tolerance in the body, which can help prevent diabetes. Irisin is the same hormone released during exercise, but in the case of cold exposure, you don’t even have to move! Believe it or not, shivering for 10-15 minutes has been shown to produce the same amount of Irisin that exercising for an hour on the bicycle. These comparisons do not state that we should stop moving your body. We’re designed to move and there are a few health risks associated with too much sitting time. Some of us have very little brown fat. But we can help build that amount by training ourselves to become a little bit less uncomfortable in the cold. As we’ve just learned, the body can adapt fairly well to keep us warm. There are few, safe ways to expose the body to cold temperatures. – practising winter sports like skiing and snowboarding. – lowering the thermostat of your air-conditioning. Remember, whilst exposing yourself to colder temperatures, it is very important to keep it safe and be mindful while enjoying a cold boost!